It all began with three broken lamps up in our attic, and a spaghetti jar. I had an idea jump into my head one day, to upcycle these broken lamps with glass jars. 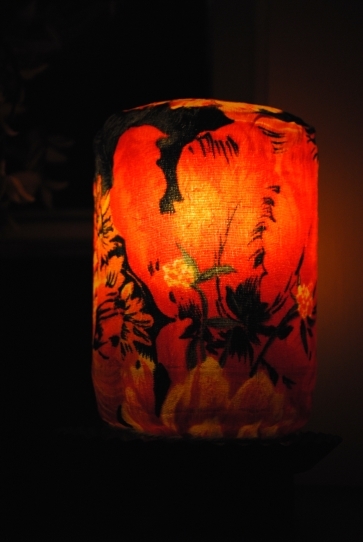 I decided to produce the first of what I was hoping would be three cloth-covered decorative lamps. I was very happy with how Upcycled Spaghetti Jar Decorative Lamp turned out so I decided to move forward with lamp # 2. This time I wanted to use brightly colored fabric on the glass. I had this great pickle jar that was slightly larger than the spaghetti jar I used previously. 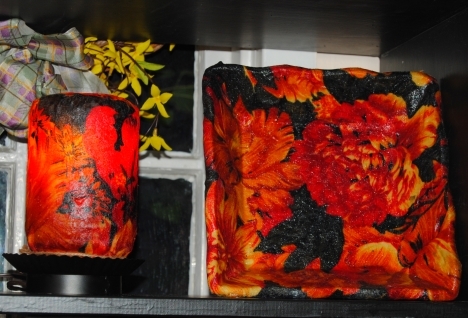 I also had some left over fabric from a previous project called Upcycled Wooden Pedestal Bowl, and Restyled Side Table that was orange, red, yellow and black. I cut a large piece of fabric, enough to wrap around the sides of the jar. I traced the bottom of the jar, (which would be the top of the lamp) onto the fabric with a sharpie marker, and cut it out with scissors. I applied Mod Podge to the outside of the jar, and applied the fabric carefully around it. I used twine to tie the fabric at the bottom. This actually looked great and allowed the fabric to touch the base. I then glued the rest of the fabric to the top of the lamp. I allowed this to dry and then I applied the Mod Podge over the fabric. I love the red hue the light gives off. It was very difficult to get a picture of what the lamp actually looks like. I had to play around quite a bit with the camera settings. I have this on the fireplace mantel in our living room. Stay tuned for lamp # 3! Upcycled Pickle Jar Lamp Pictured with Upcycled wooden Pedestal bowl. Love this fabric! Thanks : ) That was very nice of you to do! Just beautiful. And very inspiring. Thank you for sharing.